An all in-one ticket featuring travel on Great Western Railway (GWR), the West Somerset Railway (WSR) and local buses has been launched that could bring a £1 million boost to the local economy. The new ticket allows unlimited access to the WSR, return travel on the bus link between GWR’s Taunton station and the WSR station at Bishops Lydeard. GWR Partnerships Manager David Gardner said it showed GWR was dedicated to local communities and the region it served. The ticket, he said, was idea for day-trippers who want to leave the car behind. The ticket offers 19% savings against buying the separate components for those travelling from Taunton. 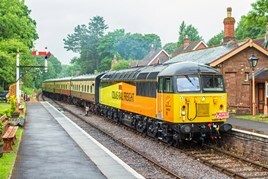 The usual peak-time restrictions are also removed from London for passengers using the ticket, and there is also a discount on entry to Dunster Castle. To book tickets, visit the GWR booking page, select your destination as ‘West Somerset Railway’, and click the ‘Are you returning?’ option. Wouldn`t a Taunton to Minehead train service be of more benefit and value ? Why not have a Taunton to Bishops Lydeard service using their Class 115 they have to replace the Bus Service.